When Fabian Wagner came to Princeton, he was already an expert on air quality and greenhouse gases, with over a decade of research experience at the Austrian-based International Institute for Applied Systems Analysis (IIASA), a leading policy-oriented research institution. With two years engaging with University faculty through a visiting professorship at the Andlinger Center for Energy and the Environment, his research reached new heights and significantly advanced the world’s understanding of environmental policy and priorities in China. “This experience provided the flexibility I needed to flourish,” said Wagner. 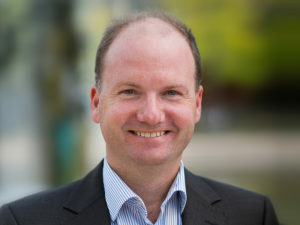 As the Gerhard R. Andlinger Visiting Professor in Energy and the Environment in 2014-2015, Wagner was jointly appointed with the Woodrow Wilson School of Public and International Affairs. He said the professorship offered a way to elevate his research by being at the intersection of science and policy. “What struck me as extremely useful was that the position offered a platform where basic science could meet policy.…to have feet in both environments was key to getting the research done and to exploring really interesting questions,” said Wagner. During Wagner’s time at Princeton, he coauthored half a dozen papers, taught courses in the School of Engineering and Applied Science and the Woodrow Wilson School, including two he developed on renewable energy and energy policy. His insights helped to spur new research that continues to yield important insights into the complex effects of environmental priorities and strategy in China. Wagner brought an integrated approach to his investigation at Princeton, collaborating with researchers across the University. While air pollution is in many cases studied on a local level, Wagner was interested in its ties to global climate change and climate mitigation efforts. He said he found a community of collaborators who both challenged his thinking and complemented his knowledge at Princeton, enabling new contributions to the field. Top of the list was Denise Mauzerall, professor of civil and environmental engineering and public and international affairs, and a member of the executive committee of the Andlinger Center for Energy and the Environment. “His expertise on air pollutants and greenhouse gas emissions was invaluable as my group characterized potential co-benefits for air quality, health and climate of various energy scenarios that could displace coal use in China,” said Mauzerall. Wagner’s research collaborations resulted in several publications in top journals, including in the Proceedings of the National Academy of Sciences and in various journals of the Nature group. His most recent work on Chinese policy and how to manage the country’scoal and natural gas fleets to achieve air and climate goals was published in Nature Sustainability in the fall. Wagner has two more papers slated to come out in Nature Communications this spring. “The time at Princeton boosted my self-confidence, allowed me to become a lot more independent in my thinking, and a lot more challenged, quite frankly,” said Wagner. The benefit went both ways. “He also connected us with a network of European researchers with whom we are continuing to collaborate since his return to IIASA,” said Mauzerall. Wagner said he continues to ask bolder questions and take risks with his research at IIASA and with colleagues at Princeton, with whom he meets twice a year to discuss various topical issues, such as the ethics of population dynamics and inequality. Wagner will return to the University to present his latest research on climate policy and sustainable growth at the Center for Human Values in May. The Gerhard Andlinger Visiting Professor in Energy and the Environment was a precursor to the Gerhard R. Andlinger Visiting Fellows Program, which provides an avenue for seasoned energy professionals to engage with and contribute to Princeton’s academic and research community. Read more about the experience and research of the Andlinger Center’s Visiting Fellows.